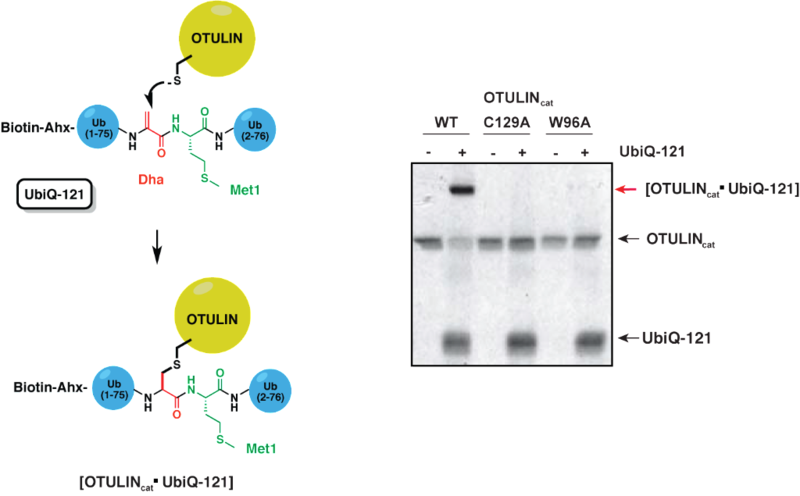 Hereby we present UbiQ-121 (1, 2) as an activity-based probe for OTULIN, a deubiquitinating enzyme that is specific for Met1 linked ubiquitin chains and acts as a negative regulator of nuclear factor κB signaling and immune homeostasis (3). UbiQ-121 is based on Met1 linked diubiquitin in which G76 of the distal ubiquitin is replaced by an electrophilic dehydroalanine (Dha) residue (Figure 1). The catalytic cysteine residue of OTULIN reacts in a covalent manner with the Dha residue (Figure 1) and as such UbiQ-121 captures OTULIN in its active conformation (4, 5). (1) Weber et al. Cell Chem. Biol. 2017, 24, 1299. (2) In a collaborative effort, UbiQ-121 was designed and synthesised by UbiQ, evaluated for OTULIN biology by the group of Prof Daniel Krappmann (Helmholtz Zentrum Munich, Germany), evaluated by proteomics by the group of Prof Benedikt Kessler (Univ. of Oxford, UK) and structural biology experiments were performed by the group of Dr David Komander (MRC Lab of Mol. Biology, UK). (3) Damgaard et al. Cell 2016, 166, 1215. (4) Besides its high reactivity toward OTULIN, UbiQ-121 only exhibits some deubiquitinating enzyme cross-reactivity with USP5/isoT (Reyes-Turcu et al. Cell 2006, 124, 1197 and J. Biol. Chem. 2008, 283, 19581). (5) UbiQ-121 is labeled with biotin on the N-terminus of the distal Ub; an aminohexanoic acid (Ahx) linker is used to create extra space for efficient access of biotin binding entities. UbiQ-121 has been prepared by total chemical synthesis (El Oualid et al. Angew. Chemie Int. Ed. 2010, 49, 10149) and is therefore well-defined in terms of biotinylation site.